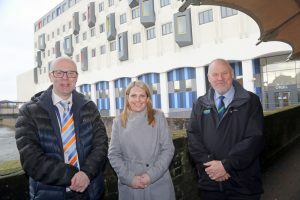 We recently showed Hannah Blythyn AM (Deputy Minister for Housing and Local Government) around our two newly completed developments in Port Talbot, along with Neath Port Talbot Council’s Leader and Deputy Leader, Cllr Rob Jones and Cllr Anthony Taylor, Cabinet Member for Regeneration and Sustainable Development Cllr Annette Wingrave and Council officials including Chief Executive Steven Phillips. The two developments, Ty’r Orsaf and Oriel, provide over 70 new homes in the town centre and benefitted from Vibrant & Viable Places (VVP) funding which focuses on regeneration activities. Since it was launched in 2013, more than £123m has been given to local authorities and their partners to help revitalise town centres like Port Talbot. The party also visited Coastal Housing’s Glan Afan development which is due for completion in the Spring. Our building contractors, Morganstone, completed work on the £4m Ty’r Orsaf (Station House) development on the site of the old Police Station in Station Road in January. 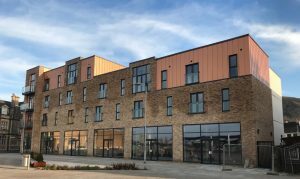 The scheme, one of a number of buildings shortlisted in the 2019 RICS (Royal Institution of Chartered Surveyors) Awards (Wales), has provided 30 new apartments over three upper floors with three commercial units on the ground floor. 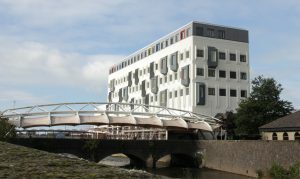 The £4.7m transformation of the riverside Aberafan House into new apartments was delivered in partnership with Hacer Developments. The striking town centre development, now called Oriel, has provided 41 new affordable homes (one and two-bedroom units) in the town centre.